Today was the SMACC pre-conference workshop called Emergency Medicine Updates. There was a series of fantastic talks by fabulous presenters (Jeremy Faust, John Vassiliadis, Lauren Westafer, Salim Rezaie, Aidan Baron, Adam Rehak, Ahilan Parameswaran, Barbra Backus, Alister Martin and Gerrie Potgieter). 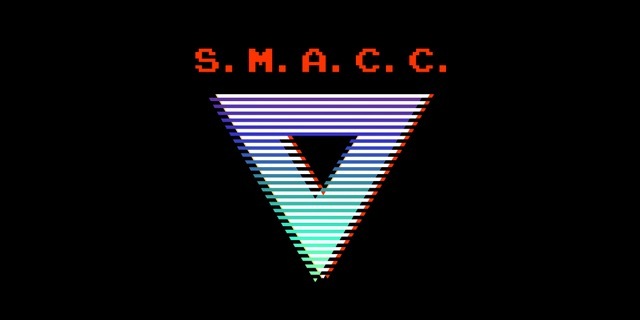 Here is a brief history of SMACC. 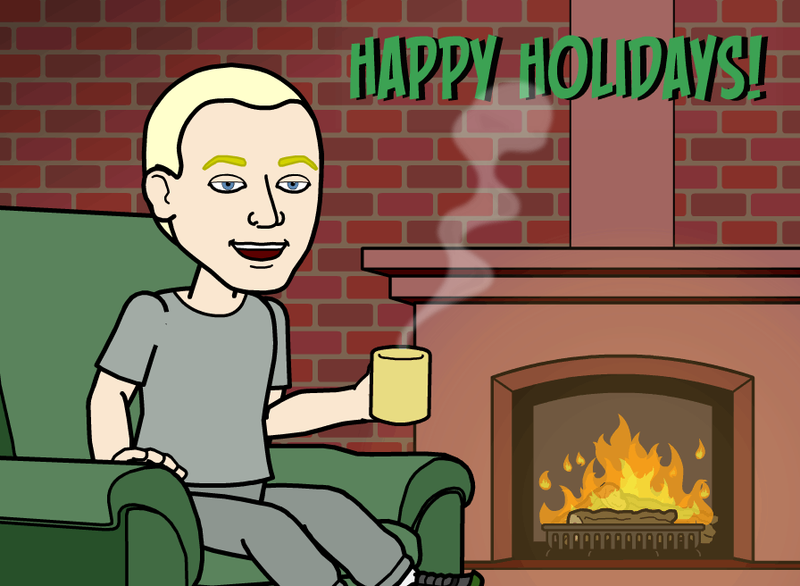 I had the pleasure of presenting at SMACCus and SMACCDub. This time I was invited to briefly describe five studies from 2018. 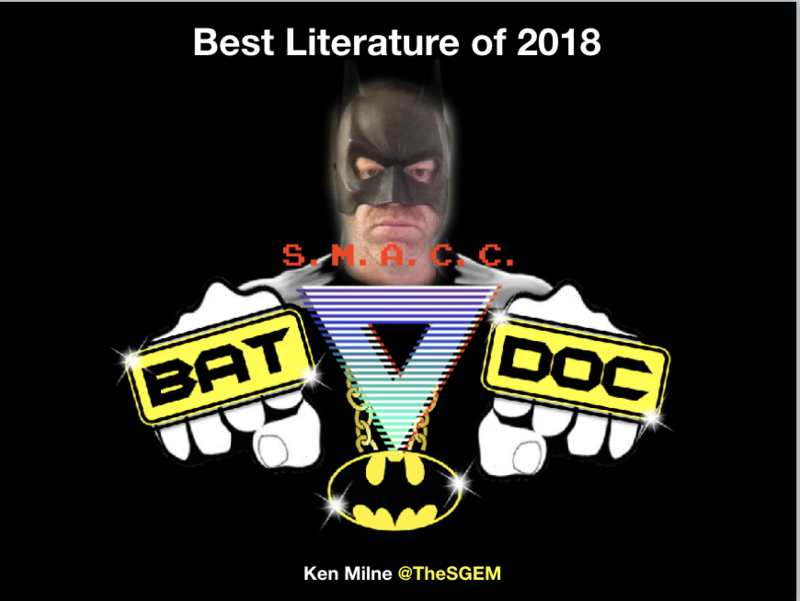 There were many other studies published in 2018 and were covered by the other faculty at this SMACC workshop. Here are the five studies that were presented at the EM Update Workshop. 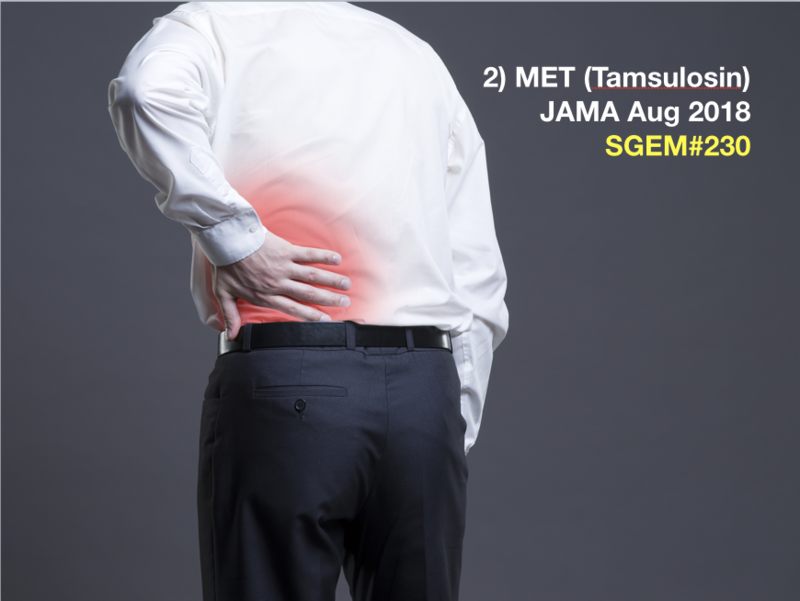 You can watch the video the SGEM Facebook page and download the slides at this link. Atrial fibrillation is the most frequent cardiac arrhythmia. 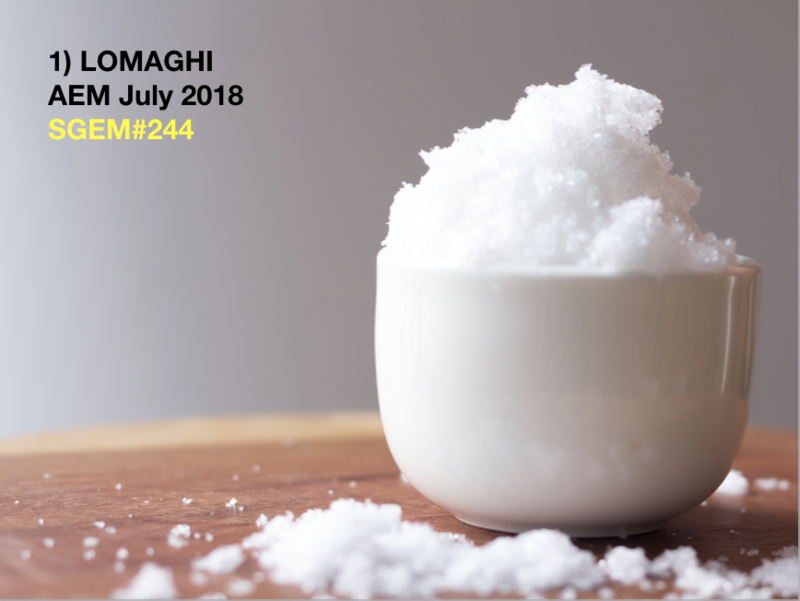 The question is can intravenous magnesium sulphate (MgS) safely and effectively reduce the rate? SGEM Bottom Line: MgS might be useful as an adjunct therapy in rapid atrial fibrillation, especially if using digoxin as AV nodal blocker but takes longer to work and has more side effects. There have been a lot of CLS (crappy little studies) on tamsulosin for renal colic showing benefit. If you take a large number of CLS and combine them into a systematic review meta-analysis (SRMA) it does not get you any closer to the truth. The biases can be compounded and you can end up with a big CLS. There have been two really well done RCTs showing no benefit for stones <10mm (SGEM#154). 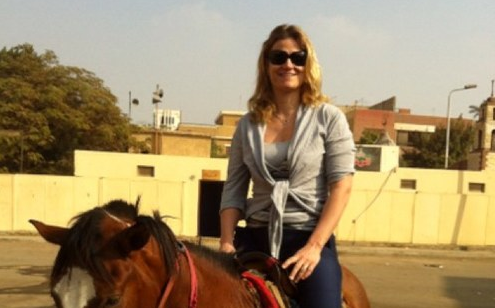 The question is does tamsulosin work for renal colic? Many urologists are still recommending tamsulosin but is it a hill you want to die on with your consultants? 3. Oxygen Strategy in Critically Ill Patients (SGEM#243): Chu DK et al. Mortality and morbidity in acutely ill adults treated with liberal versus conservative oxygen therapy (IOTA): a systematic review and meta-analysis. The Lancet 2018. There is evidence that more oxygen is not better (SGEM#192) in patients with suspected acute myocardial infarction (DETO2X). Oxygen should be thought of as a drug. Just like any other drug, it has potential benefits and potential side effects depending on dose and duration of therapy. The question, is it better to be liberal or conservative with O2 therapy? 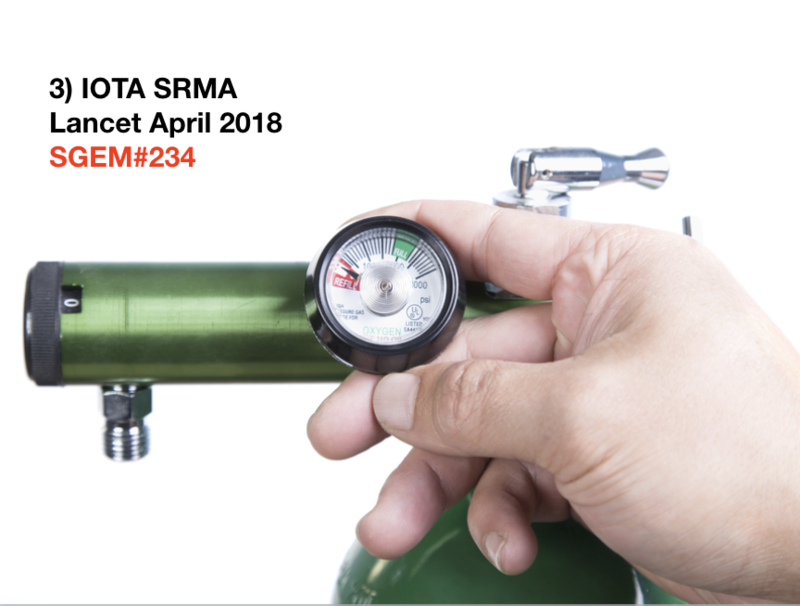 SGEM Bottom line: Critically ill patients do not need one IOTA more of oxygen beyond 94-96%. This study looked at whether or not triage nurses could clear the c-spine safely using the Canadian C-Spine Rule/Tool (CCSR)? 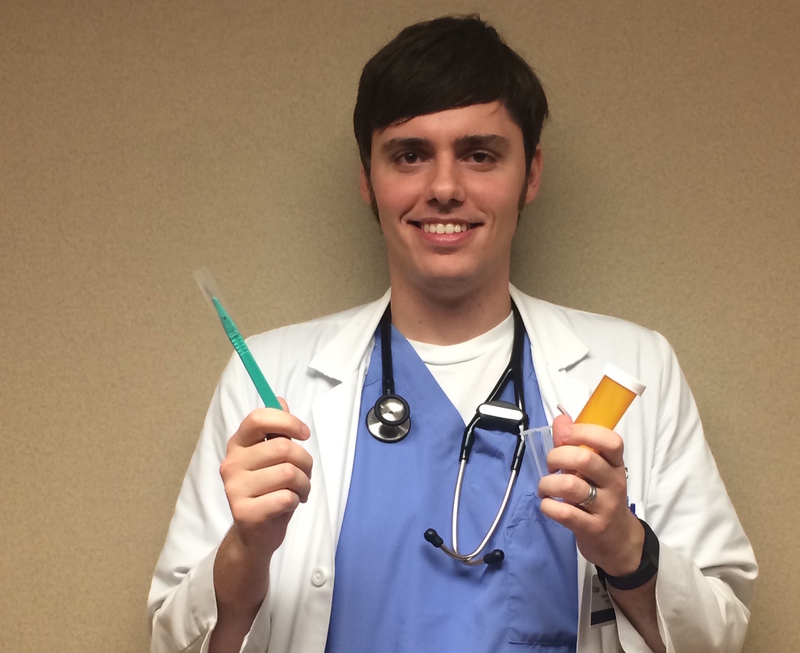 SGEM Bottom Line: Triage nurses can apply the CCSR and safely clear the c-spine. They are smart, skilled and talented part of the EM team. 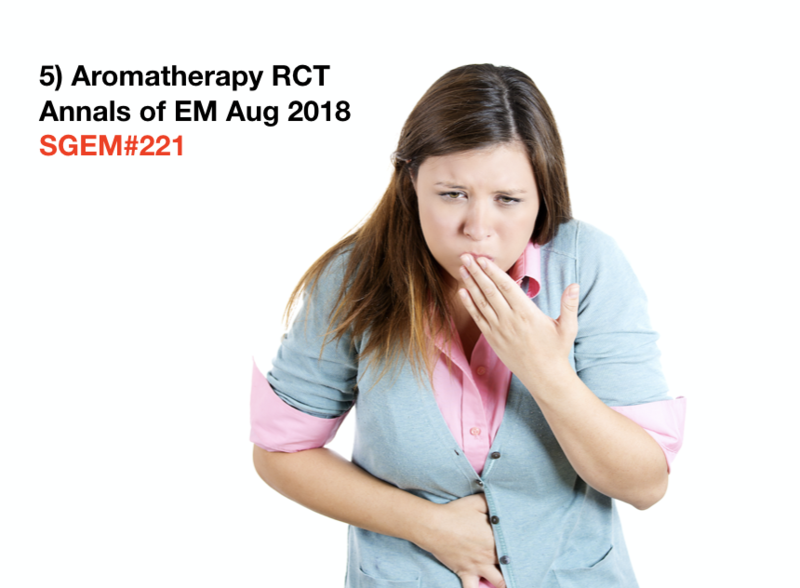 A Cochrane SRMA by Hines et al 2018 looked at aromatherapy for post-op nausea and vomiting (N&V) and concluded that aromatherapy may have similar effectiveness to placebo based on low-quality evidence. The question is does sniffing isopropyl alcohol work better than ondansetron for N&V? SGEM Bottom Line – Isopropyl alcohol might provide rapid relief for N&V but it could also be a placebo effect. 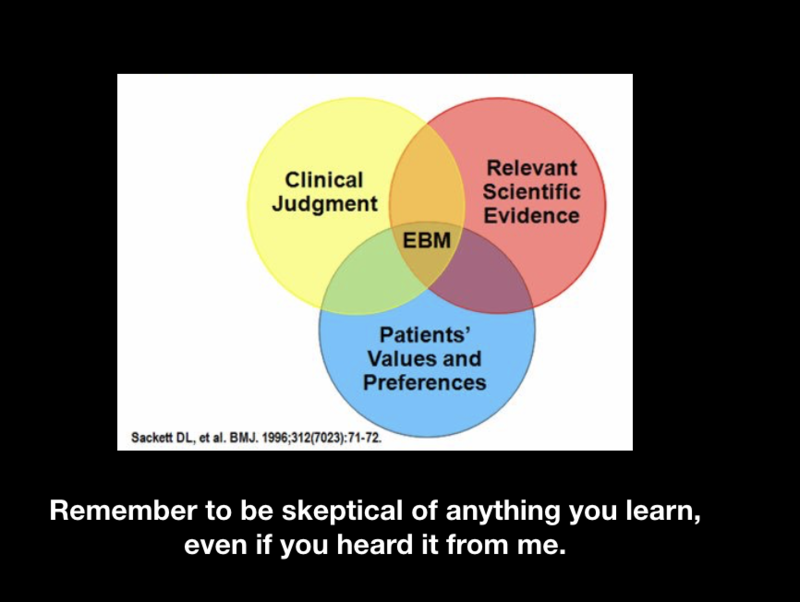 Evidence-Based Medicine (EBM) is not just about the literature. 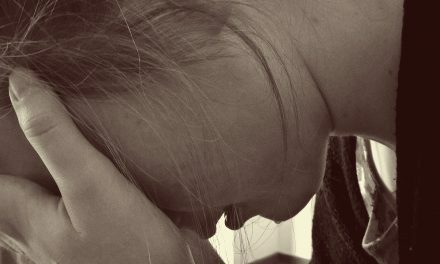 EBM can guides our care but it should not dictate our care. We still need to use our clinical judgement. We also need to ask the patient what they value and their preferences.